Chen Yuhong, born in Kaohsiung, Taiwan, graduated from the Wenzao Ursuline University of Languages. After many years in Canada, she returned to Taiwan, settling in Taipei. 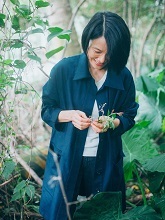 In 2004, for her collection Annotations (《索隱》), the editors of the annual Best Poetry of Taiwan named her Poet of the Year. Following her two recent poetry volumes, Trance (《閃神》) and In Between (《之間》), she received the prestigious 2017 Taiwan United Daily News Grand Prize in Literature. Of her seven poetry books, The Bewitched (《魅》) won Taiwan’s Chinese Writers & Artists Association Medal of Arts. Her work was included in Chiu Ko Publishing’s Taiwan anthology New Poetry by 30 Poets (《新詩30家》). She has also published a volume of essays 2010 Diary: An Oblique Angle of 365° (《2010日記∕365°斜角》). Among her distinguished translations are the poetry volumes The Wild Iris by Louise Glück, Eating Fire by Margaret Atwood, Rapture by Carol Ann Duffy, and the novel La Citadelle de Neige by Matthieu Ricard. A collection of her own poetry, selected and translated into Japanese by Sato Fumiko as I Once Told You (『あなたに告げた』), appeared in 2011. Chen represented Taiwan at the 2014 Nicaragua Poetry Festival, also serving as Beijing’s Renmin University 2015 Poet-in-Residence. She lives in Taipei with her husband and their cat Coconut. Poet and painter Yang Jian, was born in 1967 in Ma’anshan, Anhui Province, China. He began studying and writing poetry in 1986, and is a practicing Buddhist. Among his literary awards are the Liu Li’an Poetry Prize, the Rou Gang Poetry Prize, the Yu Long Poetry Prize, the China Top Ten Pioneer Poets Prize, the Poetry Prize of Media Awards for Chinese Literature, the Luo Yihe Poetry Prize, and the Yuan Kejia Poetry Prize. His poetry collections include Dusk (《暮晚》); Beside the Ancient Bridge (《古橋頭》); Remorse (《慚愧》); Temples of Grief (《哭廟》); and Selected Poems of Yang Jian (《楊鍵詩選》). Since Yang Jian began painting In 2008, his work has been featured in a number of solo and joint exhibitions. “Faces of the Dao“, a selection of his ink and brush paintings, appears in the Spring 2014 issue of Pangolin House. Share the post "Winter 2017-18"